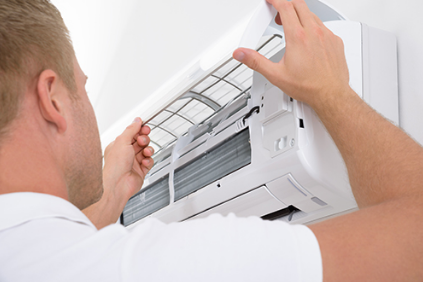 Many AC problems tend to start small then turn into major expenses if they’re not addressed right away. Even though summer in Wisconsin is drawing to a close, it’s still important for homeowners to stay alert for these telltale signs of trouble. Guelzow Heating & Air Conditioning Service of Wisconsin Rapids has decades of experience repairing air conditioners of all kinds, so they know which minor problems are worth fixing ASAP. If you notice any of these four problems with your air conditioning unit, make your AC repair appointment now! If your home doesn’t feel as cool as it should, try putting your hand next to the AC vent. Is the air current weak? If so, it’s time to call in your AC repair professional. This warning sign could indicate a simple problem like a clogged filter, but it can also mean your compressor is failing and needs to be replaced. If you have this problem in some rooms but not others, your ducts may be the problem. Any noises louder than your AC unit’s normal sound should be cause for alarm. Pay special attention if you hear grinding or squealing noises. If you see water dripping from your air conditioning unit or pooling next to it, your air conditioner might be leaking coolant. Ice on your AC unit is another telltale sign. If the air coming from your AC vents starts to smell bad, schedule a repair appointment right away. Mold inside the AC system can cause health problems if it’s left unchecked. Guelzow Heating & Air Conditioning Service has been Wisconsin Rapids’ most trusted AC and furnace repair company since it was founded in 1953. These experienced contractors can handle your heating and cooling needs for every season, including installation, maintenance, duct cleaning and 24-hour emergency furnace repair. Call them at (715) 423-1086 to get a quote, or visit their website to learn more about the services they offer.